The Kardashians are no strangers to online criticism, and after Tristan Thompson allegedly cheated on Khloé again, this time with family friend Jordyn Woods, the internet was a war zone. Between getting made fun of for the situation and being slammed for the way she reacted, Khloé was not safe from backlash. And she has responded to quite a few haters. Redditor bgm1993 noticed one clapback in particular in which KoKo took the high road and told a troll she'd be praying for her. After the 34-year-old reality star took to Instagram to share an adorable video of her and daughter True, haters came in full force to the comments section. As Khloé's caption read, "Great Morning!!! !," one especially rude person decided to comment, "I bet Tristen [sic] is thinking the same thing waking up in another woman's bed." 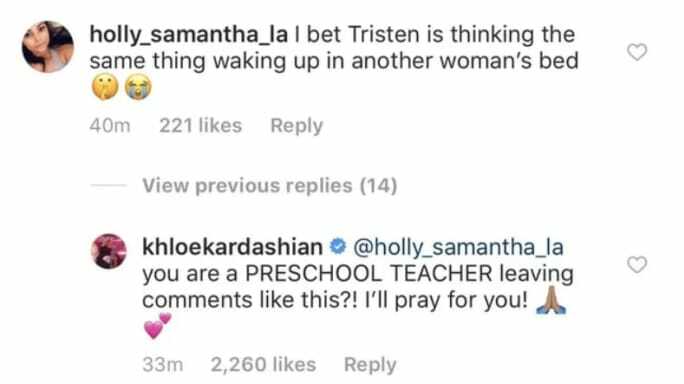 Clicking on this person's Instagram profile, Khloé learned she is a preschool teacher, and responded accordingly. She has a good point! Thankfully for every nasty comment, there are 10 incredibly sweet ones, as we know Khloé's fanbase is at an all-time supportive high after all she's gone through as of late.